Cookin’ Up Some Dilly Beans! 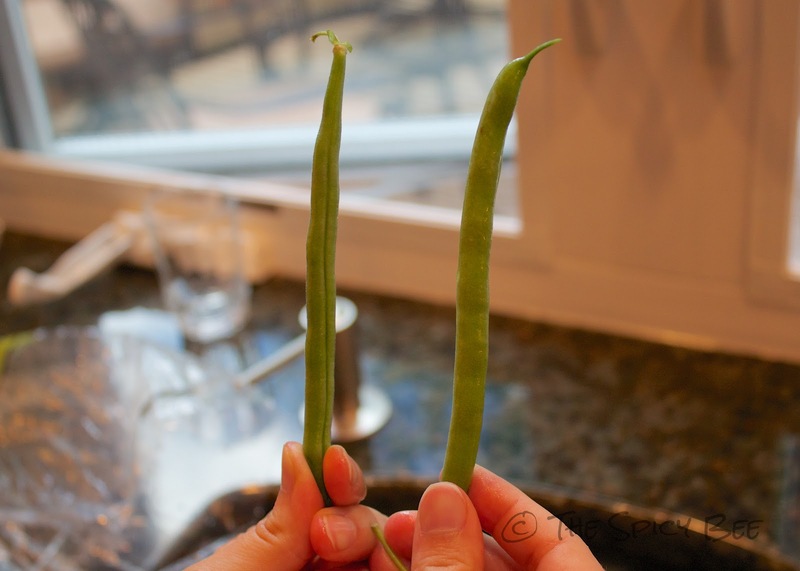 Today is all about dilly beans and how to make them at home. No better time than the present I suppose–let’s get to work! 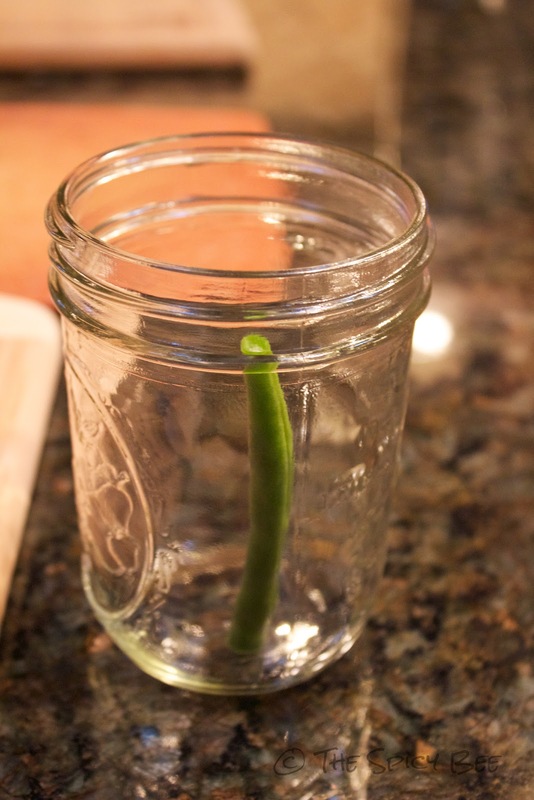 Before you begin: SUPER IMPORTANT–make sure your mason jars are clean! We ran ours through the dishwasher just before starting the jarring process. You do not want residue or bacteria in the jars. Also, if you are using old jars (which is fine) make SURE to buy new sealing tops to use with your jars. 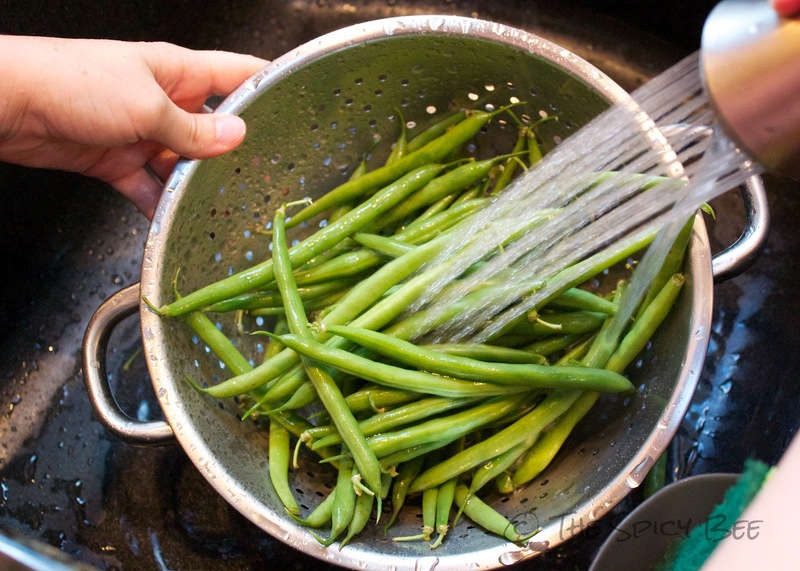 First off, thoroughly rinse your beans under cold water. Pat dry and add to large container. Check out your beans as you go. You want them to be as straight as possible (obviously, you would have to look closer if you decided to buy a box and pick from that. We picked ours by hand at the grocery store so we didn’t have to do much work checking). Size your beans to your jar. 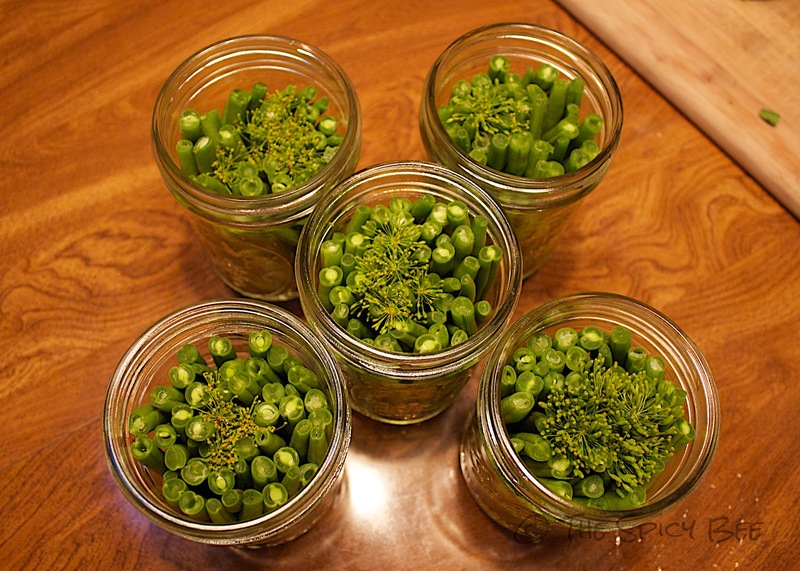 You want to cut them so they are about 1/4 inch from the top of the jar. To help this process move along quickly, for each person you have cutting beans (we were lucky to have 4!) give each person a measure bean to cut from. This way things are much more uniform. Cut away! First cut and discard the end that attaches the bean to the plant, then cut (leaving as much as possible) of the other end of the bean for eating later! Do not discard your measure bean! 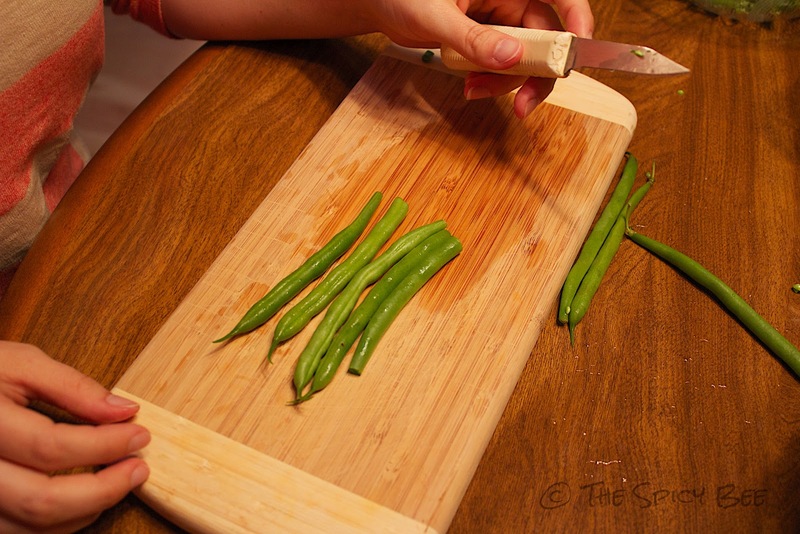 My measure bean is at the top of my cutting board, and I measured each bean to it. 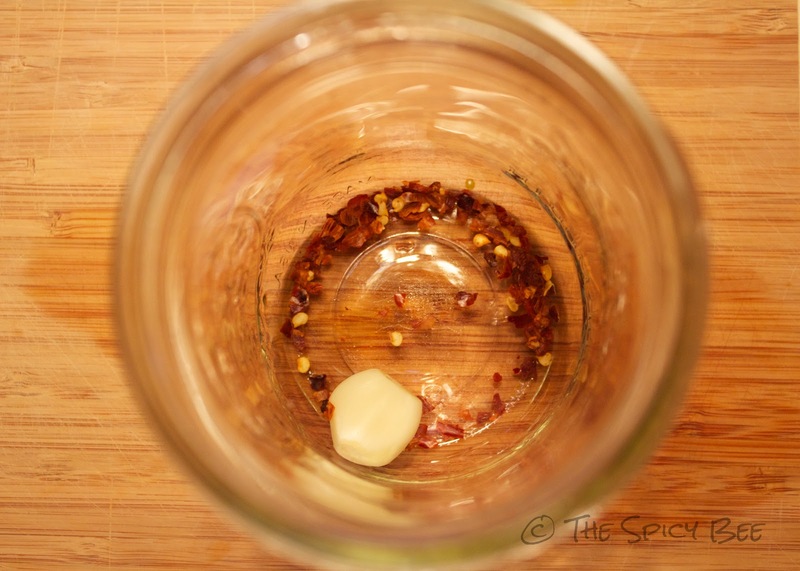 Meanwhile, load up and fill up your pristinely clean jars with your chili flakes and garlic cloves. Now starting with your most beautiful beans, line the outer parts of the container (because these will be the most visible, and if you give these as gifts you want them to look presentable!). 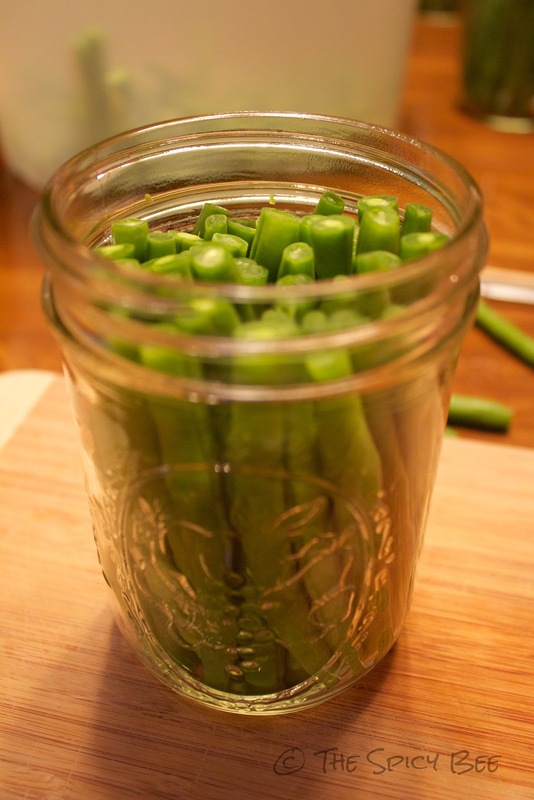 Once you fill up the outside, you can start cramming them into the center part of the jar. Gorgeous! Now were you wondering what the chopsticks were for? They will be useful here on out! Use the thinner end of one to push into the jars, packing and freeing up space to cram the last one or two beans in. We want them packed in like sardines, people! Note here: We used wide mouthed mason jars for this project. You do not need to use wide mouth. You are more than welcome to use the narrower mouthed ones, but wide sure made the cramming process easier. 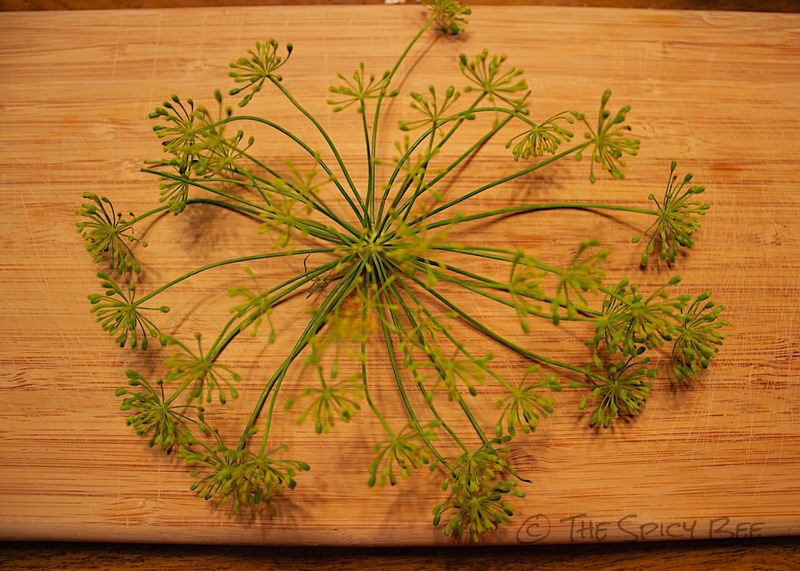 Look at that pretty dill! I am not normally a huge fan myself but boy does it add some nice flavors to the dilly beans. Now the dill pictured is a bit big for our jar so I cut this in half. That made the perfect size. Chopsticks are great here, too! 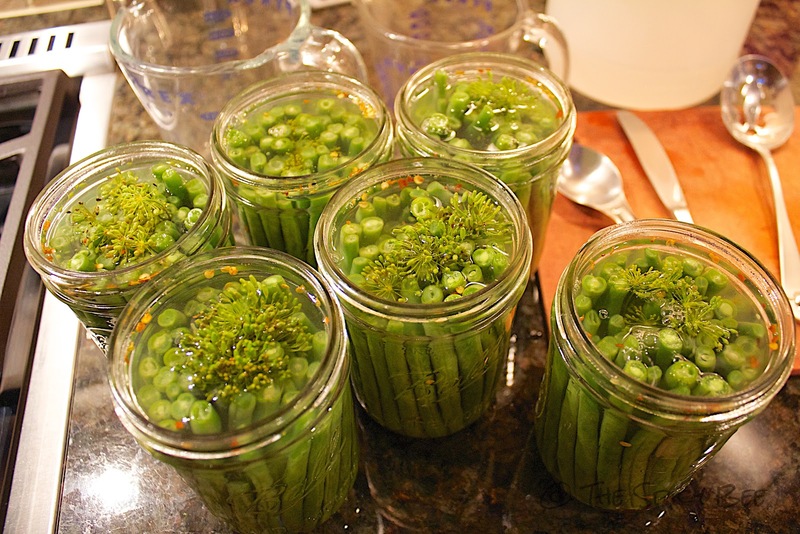 Place your dill in the middle of each jar and proceed to push down with the thin end of the chopstick until only the buds are visible above the beans. It is now time to boil up your water, vinegar, and salt. 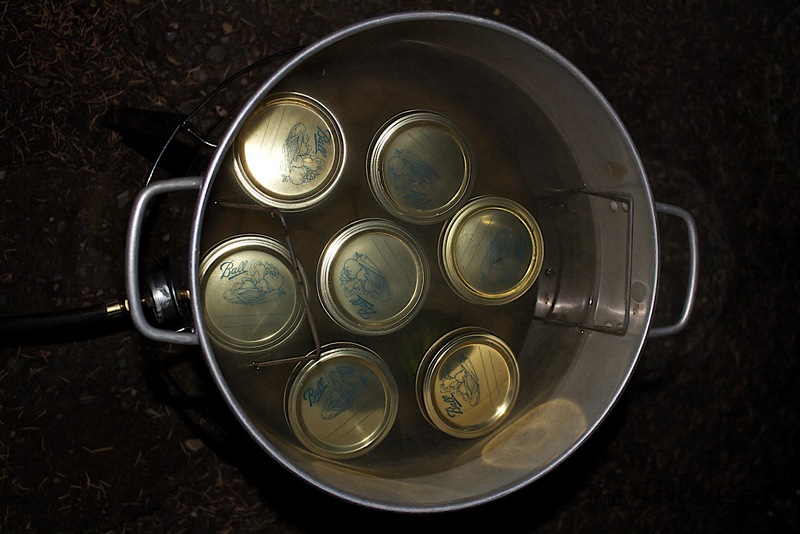 Once at a rolling boil, remove from heat and slowly pour liquid into each jar, stopping 1/4 inch from the top of the jars. Use your chopstick again, this time slowly inserting it into each jar and wiggling to remove any air bubbles. After you’ve filled everything, wipe the edges of the jars with a warm, clean rag and close them up! Congratulations! You’re almost there! We are now going to process these bad boys in boiling water for 10 minutes (COMPLETELY SUBMERGED). This is also where my photography goes to hell because we processed ours in the dark, outside in a propane-heated pot! A couple things to note–before you boil these make sure you haven’t closed them up too tightly or you will have a really rough time taking the rims off later. Close them enough to seal but do not wrench shut. Also, when putting the jars into the boiling vat, do NOT drop or plop them in. Use your mason tongs and slowly place them on the bottom of the pot. I was told that it is very easy to shatter the jars from the bottom and we don’t want you losing one of your 7 children I mean jars. Once you’ve boiled the jars for 10 minutes, remove them from the vat and place on a heat resistant surface (towel or better yet a wooden cutting board), and wait for the pops! The popping means that your jars have sealed properly and they are ready to store. It may take a little while for them all to pop, so feel free to leave them out for a couple hours to do so. You can check for the pop on them by looking at the top of the jar from the side (you should see the top slightly depressed or “sucked in”). 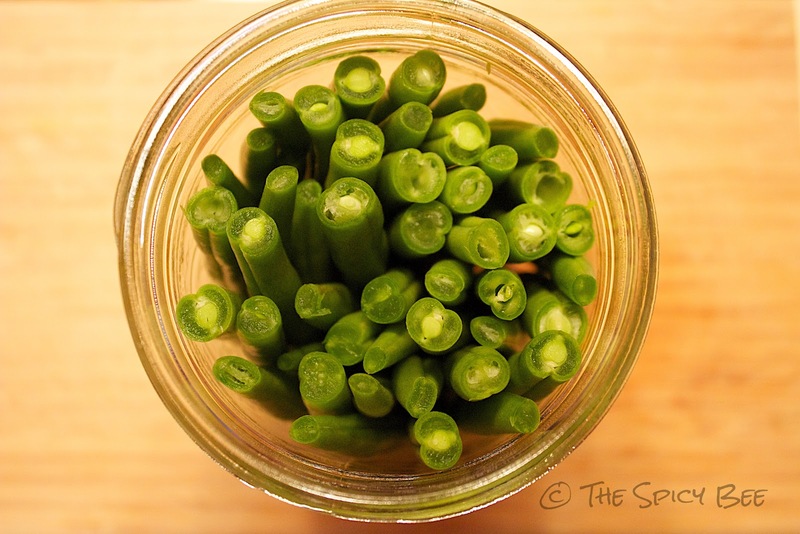 If you do not see this on a couple of jars, you may want to refrigerate and eat soon! Even though all of our jars did pop, we noticed that there was a little leakage after storing them for a week. This is normal and does not mean they didn’t seal. You do not have to do any further cooking of the beans after the jarring process. Just pop open a jar and munch away! Any questions? I may not be able to answer them but I have a resource that can so ask away! Jarring was a great experience, and we hope to be jarring jalepeños this fall!